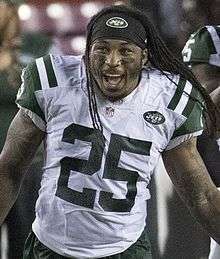 Calvin Starlin Pryor III (born July 2, 1992) is an American football strong safety for the New York Jets of the National Football League (NFL). He was drafted by the Jets in the first round of the 2014 NFL Draft. He played college football at Louisville. A native of Port St. Joe, Florida, Pryor attended the local high school where he was a three-sport athlete in football, basketball and baseball. He played both running back and defensive back for the Tiger Sharks. Considered a three-star by Rivals.com, Pryor was rated the 31st-best safety prospect in the nation. Pryor attended the University of Louisville from 2011 to 2013. During his tenure, he accumulated 218 total tackles, including 11 for losses, two sacks, seven interceptions, and nine forced fumbles. He was a second-team All-BIG EAST selection as a sophomore, and a first-team All-AAC selection as a junior. Pryor was selected by the New York Jets as the 18th pick of the first round of the 2014 NFL Draft.